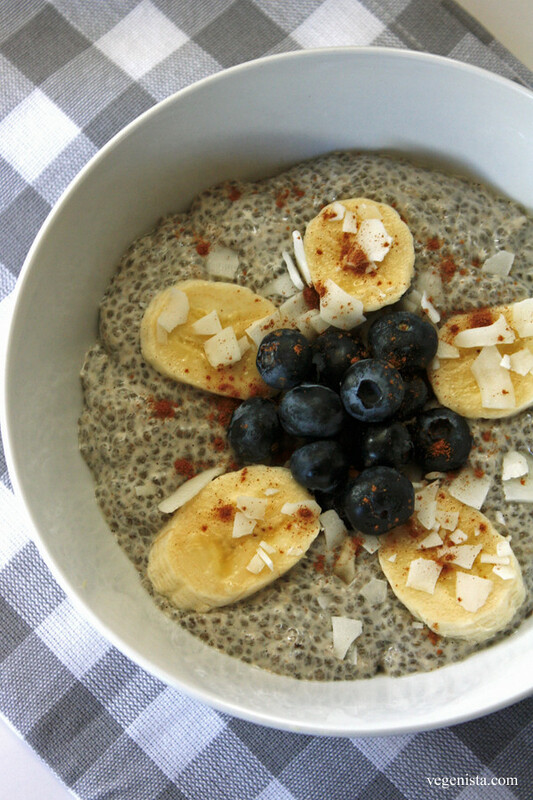 Raise your hand if you’ve tried the chia pudding at True Foods Kitchen. Raise both hands if you’re obsessed with it! (Both of mine are raised!) Seriously though. It’s so creamy & rich & mouthwateringly flavorful. I’ve got to get to the bottom of it. Last time I was there, I asked the waiter what was in it. “Chia seeds!” he exclaimed. I replied thought cattily to myself, “Well, no shi*t Sherlock,” & then kindly replied, “Yes, I know that, but what do they soak & blend them with to make it so decadent?” Aaaand…crickets. So he wasn’t any help. And neither was google, at least in procuring the “one & only” recipe. 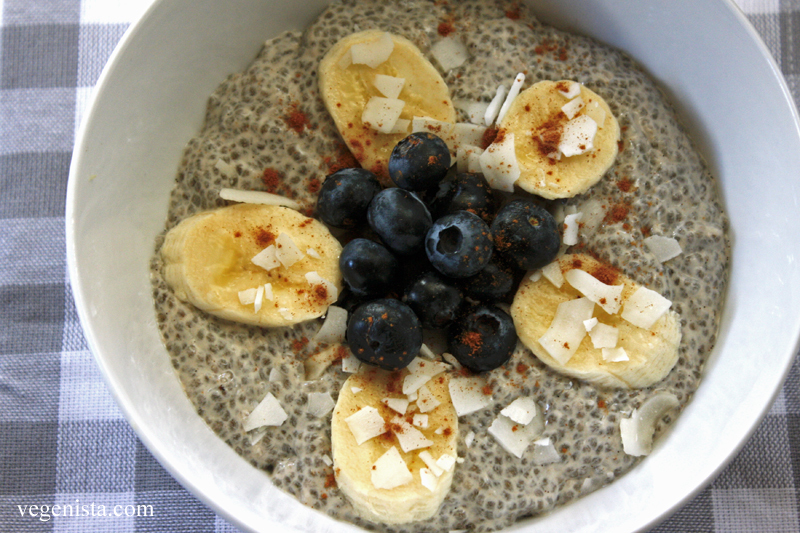 Other bloggers had attempted recreation using, what I had suspected…coconut milk & mashed banana blended with the chia seeds. After an intense craving ensued, at 6 o’clock in the morning, I set out to make my own attempt, as I am sure True Foods would not appreciate me breaking in to the restaurant in a chia fueled frenzy. The only problem — no coconut milk on hand, & only 1/2 of a banana. Wayul…them’s the breaks. But I did have fresh homemade almond milk & chia seeds. 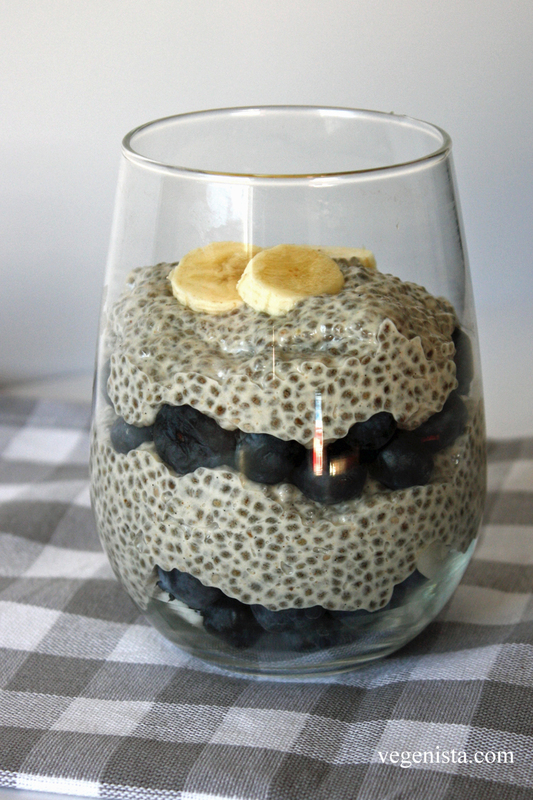 So a basic chia pudding recipe, I settled to create. Well…basic with a little something special…a vanilla bean! Add almond milk, vanilla beans, & agave to a blender. With the blender on a very low setting, add the chia seeds, & blend. Pour into a large mason jar. Chill for an hour, then return to the jar & shake or stir. Let chill for at least 4 hours, or overnight. To serve, top with banana, blueberries, coconut & cinnamon, or fresh fruit of your choice. While I absolutely love True Foods’ chia pudding for dessert, this is a little lighter & works wonderfully as a nutritious breakfast treat. 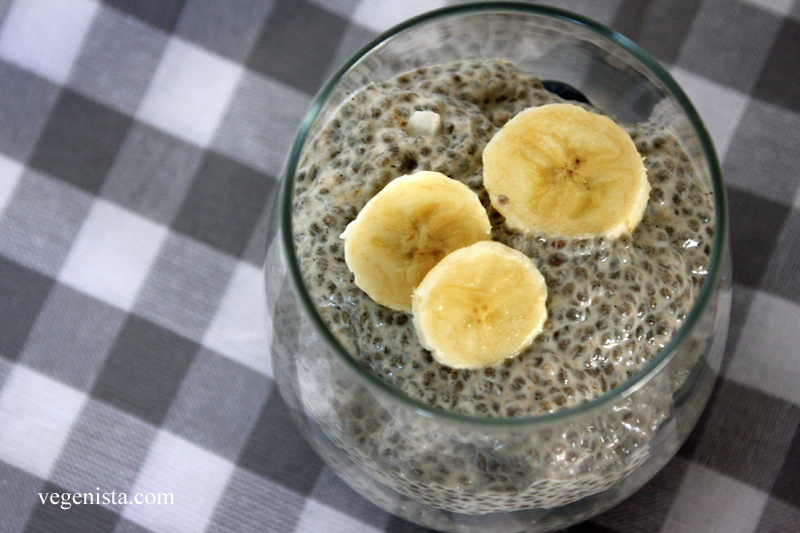 Chia seeds are a nutritional powerhouse, containing omega 3 fatty acids, protein, fiber, & calcium. When mixed with liquid, they absorb up to 10 times their weight in water & expand into a pudding like consistency, meaning they also expand in your belly, helping to keep you sated & energized throughout the morning. Oh & a fun & fancy serving tip….I love to layer the pudding with fresh fruit, & sometimes oats or granola, in a stemless wine glass for a festive parfait presentation. Now isn’t that so sweet? And while it doesn’t totally hold a candle to the True Foods masterpiece, this does the trick for now. I’m off to the store for more bananas & coconut milk. I’ve got to crack the code!